A week ago we spent a day spring-cleaning and decluttering our house. During this exercise we actually got rid of quite a lot of books. It breaks my heart to give books away but we have a very small house and a great deal of books, and the shelves we had custom-built in which to accommodate them are already full to bursting. Plus, there were certainly books on the shelves that neither of us will ever read again, and we intend to give them to charity so at least someone else will benefit from them. However, clearing some space on the shelves downstairs did mean that I was able to find room for some books that had been sitting in a box in our spare room. Before that, they were sitting in a box in my parents' loft, where they'd been since I left home almost twenty years ago. One of these books belonged to my brother and was passed on to me, the other I bought second-hand, probably from a jumble sale or a school fete, as I seem to remember being at one or both of those things at least every other Saturday when I was a child. They're very much of their time (both published in 1978) and have fabulous, garish illustrations. I had completely forgotten I owned these books, yet their covers are so immediately familiar to me that I almost felt as if I'd stepped back in time when I took them from the box. I was always fascinated by ghosts, horror and the supernatural and books like this captured my imagination as a child, along with various films and television programmes from around the same era. These probably look like cheap, insignificant tat to most people, and frankly they probably are, but they had a significant influence me and really helped to shape my interests and the fiction I like to write. I'll never give them away. There are NEVER cheap insignificant tat to me. After reading your notes as far as I am concerned these are buried treasure that have just been unearthed! I actually remember reading these books when I was a kid. I borrowed them from the library and I think at one point I owned one of them which I gave away to a cousin of mine. It is wise you decided to keep these books as they are rare and are worth a few bob now. As you mentioned in your notes the problem with books is that they take up a lot of room which is why these days I do my reading on kindle! I read other similar book before when I was a child. You may remember years ago the Usborne books. There were three of them in a set: ‘Usborne Book of Ghosts’, ‘Usborne Book of Monsters’ and the ‘Usborne Book of UFOs’. They were often found in the library and you can get them as three separate books or all three of them together in an omnibus volume called: ‘Mysteries of the Unknown’. Like the Hamlyn books they are beautiful and very interesting to read and are illustrated with some wonderful pictures and photographs. The imagery contained within are, as you say garish and at times gruesome and macabre to the point of being terrifying maybe even a tad too terrifying for kids. 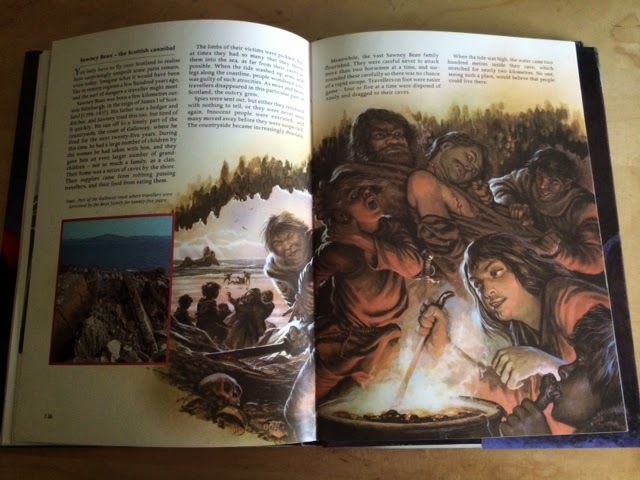 I remember some of the stories and looking at the illustrations and having nightmares over it - but that was part of the fun. They are after all ghost/horror books! It is hard to believe books such this were made in those days. Still it is the old cliché - they don’t make em like they used to! 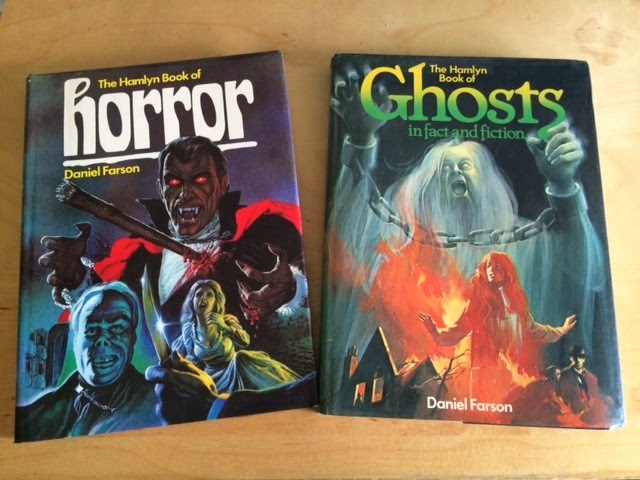 Usborne also produced another three set of similar books: ‘Vampire, Werewolves and Demons’, ‘Haunted Houses, Ghosts and Spectres’ and ‘Mysteries Powers and Strange Forces’. These are like the previous set (creepy stories with gruesome illustrations) but in smaller volumes and like previous set you can get them separately and or in one volume, which is this case is called: ‘The Usbrone Book of the Supernatural World’. I recently brought both omnibus sets from Amazon. The ‘Mysteries of the Unknown’ book was strangely cheap (just under £3 and are still on sale for that sum) but the ‘The Usbrone Book of the Supernatural World’ set me back about £28 (and they are now exchanging hands for around £50 upwards). Looking at these books again after so many years felt like (as you mentioned yourself) I had been transported back in time. On a final note, I am going to get the Hamlyn books next, though I may have to wait a bit as they are expensive to get hold of. I recognise the picture you posted on the right. It is from the ‘Hamlyn Book of Ghosts’ about the ‘Walsingham’s hauntings’. (The picture shows victim Horace Gunn after his ordeal in the haunted houses with the spectre that terrified him). 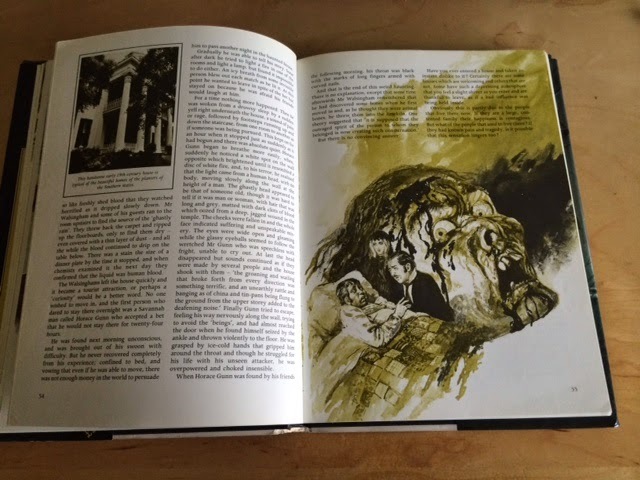 Daniel Fearson also wrote the ‘Hamlyn Book of Monsters’. There is also a fourth volume in the canon: The ‘Hamlyn Book of Mysteries’ but this was written by Bernard Brett.